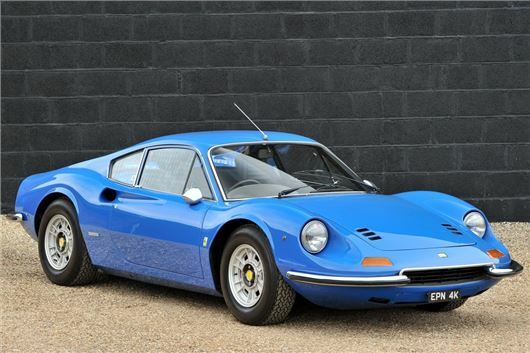 A 1972 Ferrari Dino 246GT is set to go under the hammer at Race Retro. The car, which is one of 235 UK right-hand drive examples, will head to auction at Stoneleigh Park on 23 February. One of just a few cars finished in Azzurro Dino, the car comes with its Classiche 'Certificato di Autenticita', and will be offered at the auction with a sale estimate of £240,000 to £280,000. Guy Lees-Milne, general manager, Silverstone Auctions, said, ‘This stunning E-Series Dino has to be one of the most original and unmolested 246GTs anywhere. Delivered new in December 1971, it has a Nero leather interior and optional radio, nose bar and electric windows. It has just four registered keepers on the logbook and has been regularly maintained by marque specialists, reading a total of just 51,786 miles today. The Dino is also supplied with its Classiche 'Certificato di Autenticita', issued on 25th July 2016, which is presented in a beautiful bespoke red box with enamel badge. It also comes with an 80-page, bound owner's file, original Bill of Sale (£5124.17), V5C, invoices, historic MoTs, and the original leather wallet with operating manuals, original warranty card, and wiring diagram. The boot of the car also contains the tool roll and jack, which is also finished in Azzuro Dino. To find out more about the 1972 Ferrari Dino 246GT Coupe for auction visit silverstoneauctions.com.